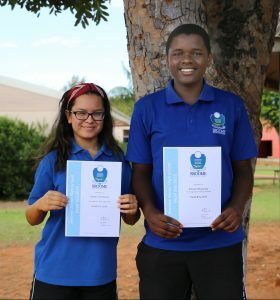 The selection of Broome Senior High School’s Head Girl and Head Boy starts each year during Term 3 with a formal nomination process. Students in Year 11 wishing to be considered are asked to answer questions about their personal involvement with the school, why they believe they would be suited to the role and what they wish to achieve as a student leader at Broome Senior High School. This is followed by each candidate delivering a short speech to their Year 10 and 11 peers as well as staff who then vote for their preferred candidates. “I was hoping to be voted for. It’s exciting and a little overwhelming right now. It’s a big role!” – Damar Isherwood, Head Girl 2019. Current Year 11 Leader Ms Olds said of the successful candidate’s speeches; “They were both confident and approachable in their delivery.” She believes the way they presented themselves as part of the student body connected them to their peers. She also said all nine nominees were strong contenders and she hopes to see at least some of them make their way onto the Student Council next year. Speaking with both Damar and Sinclair after the announcement assembly it was obvious they have a clear and shared view of what they want to make of their new roles. Congratulations to Damar and Sinclair we know you will do a wonderful job representing the Broome Senior High School student body in 2019.